Found 95 blog entries for January 2015. Afro-Cuban/Funk/Reggae group from Seattle, Blu Meadows will be performing at The Emerald of Siam 1314 Jadwin Richland, Washington on Friday, February 6 at 9:00 in the evening. Admission is free. 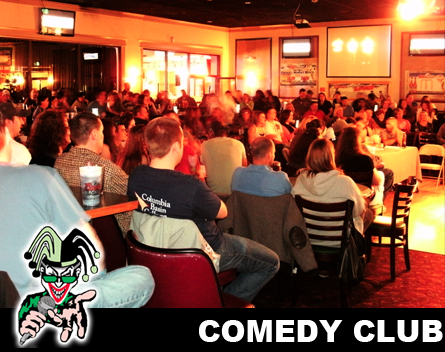 On Thursday, February 5 call all your friends and check out Funniest Portland Comedians at the Jokers Comedy Club 624 Wellsian Way Richland, Washington at 8:00 in the evening. On Thursday, February 5 from 8:00 until 10:00 in the evening everyone is invited to "Geeks Who Drink - Trivia Night" at The Emerald of Siam located in 1314 Jadwin Richland, Washington. Geeks Who Drink is a homegrown Pub Trivia Quiz modeled after those in Ireland and the UK. The quizzes will cover everything from celebrities in trouble to wordplay to bad television. Each quiz has two audio rounds: a "Name that Tune” style round, and another round comprised of soundbites from movies and TV. Play in teams of up to six or by yourself if you're some kind of savant. If you want to play but don’t have a team, come anyway. If you love the arts you are invited on Thursday, February 5 from 5:00 until 9:00 in the evening for the Kennewick Art Walk in historic downtown Kennewick. Be a part of this event where several businesses, including galleries, open their doors for the evening showcasing art and the artists who create the art. Explore Grenache from six different winemakers and see what your palette prefers! This is happening on Thursday, February 5 from 6:00 until 8:00 in the evening at Walter Clore Wine & Culinary Center in Prosser, Washington. Invite your family and friends and Sample 8 different Washington Rosés, seven from the same grape. Plus, exciting prizes will be given to the person with the most discerning palette. 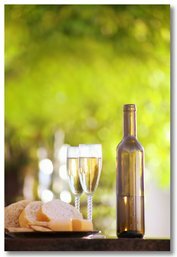 Registration fee is $30.00 and includes 8 wines to taste and light bites. Limited seats are available. On Thursday, February 5 please come to the "Cybersecurity Impacts Everyone" at the Mid-Columbia Libraries 1620 S. Union Street Kennewick, Washington at 7:00 in the evening. David McKinnon will discuss what roles cyber security play in everyday life and he will also provide tips that may help keep your information more secure. 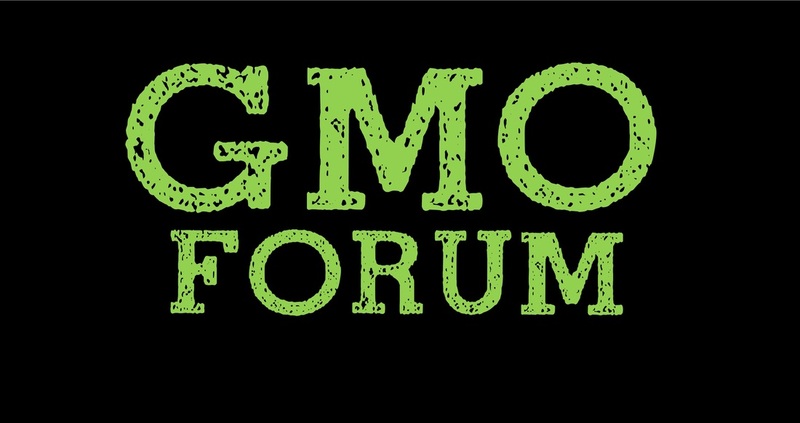 On Tuesday, February 3 from 5:30 until 7:30 in the evening join the GMO Forum happening at the REACH in 1943 Columbia Park Trail Richland, Washington. A Dialog on Genetically Modified Organisms—GMO’s Get the facts about GMO! Dr. Amit Dhingra from the Dept. of Horticulture at WSU will talk about cautionary concerns about GMO’s from both an Ag producer and the public’s standpoint. 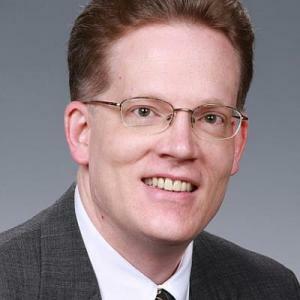 James Curry, Director, State & Local Government Affairs, Pacific Northwest Region, Monsanto will present biotechnology benefits, challenges facing farmers, public policy and political challenges such as labeling, ballot measures and what’s next. 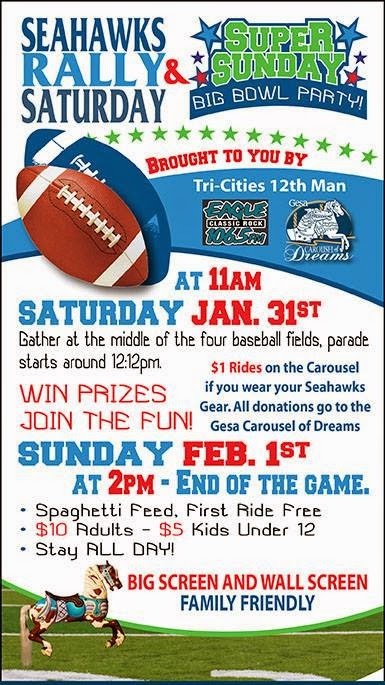 On Sunday, February 1 Gesa Carousel of Dreams, 2901-F Southridge Boulevard in Kennewick, Washington welcomes everyone to the Super Sunday Big Bowl Party & Spaghetti Feed. Event starts at 2:00 in the afternoon. Mark your calendars and invite your family and friend! Spend the whole day at the Carousel of Dreams! Big screen and wall screen. Family friendly! First ride on the carousel is free! Get your Seahawks on and join us. Go Hawks! If you love non-stop action, randomness and just an exciting game, come and watch a hockey match between Tri-City Americans vs. Everett Silvertips on Friday, February 6 at Toyota Center Kennewick located in 7000 W. Grandridge Boulevard Kennewick, Washington. Single-game tickets and Tournament packages are now on sale! Game tickets can be purchased through all Ticketmaster outlets, including all Fred Meyer locations, online at: http://www.ticketmaster.com, or at the Toyota Center box office, 509 737-3722. Walk-up (individual games): For Tournament packages or to find out about group and other discounts, call the Americans' office at (509) 736-0606. You may call 509-737-3722 or go to http://www.amshockey.com, for more information.